The World Trade Center Terrorists Threatened to Attack Nuclear Facilities....and trained only 30 miles from Three Mile Island where they practiced a night-time mock assault on an electrical power substation. Calling themselves the "Liberation Army Fifth Battalion" in a letter to the New York Times, the World Trade Center terrorists threatened to attack additional targets, including "nuclear targets" with "150 suicide solders." The letter was received four days after the bombing and subsequently authenticated by federal authorities. (The World Trade Center was bombed on Feb. 26, 1993.) The motive for the attack was revealed in the one page letter. "The Americans must know that their civilians who got killed are no better than those who are getting killed by the American weapons and support. The American people are responsible for the actions of their government and they must question all of the crimes that their government is committing against other people, or Americans will be targets of our operations that could diminish them." They made a list of demands which included an end to interfering "with any of the Middle East countries interior affairs." Although other terrorists have previously threatened to attack US reactors, the World Trade Center terrorists could have gotten their inspiration by an intrusion at Three Mile Island just three weeks before the bombing. A US Senate hearing was held to evaluate the implications of these two events and what they implied about security at the nation's nuclear power plants. the TMI intrusion "a warning bell" and the bombing of the World Trade Center "a warning earthquake." Lieberman called nuclear plants "soft targets" after viewing a video which was prepared by the licensee (GPUN) to explain their security and demonstrate the intruder's route. 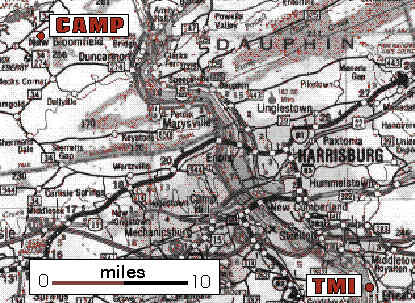 "In late 1992 to 1993, training was conducted at a camp near Harrisburg, Pennsylvania for operations and assassinations in the United States and overseas." Kelvin Smith, a self-described Sunni Muslim, taught martial arts and survival skills to visitors who rented his campgrounds. (On the same weekend that the TMI intrusion occurred, the World trade Center terrorists were observed by law officers performing a nighttime mock assault on a nearby electrical substation.) Smith is alleged to have taught the soon to be terrorists hand-to-hand combat skills and physical training. The FBI conducted the raid on the training camp two days after the second plot to bomb multiple targets in New York was foiled. But, the FBI had not informed the NRC or TMI of the proximity of the training camp either! The NRC had been notified about the threat to attack nuclear targets four months earlier but not the location of the terrorists' camp! This is an outrageous oversight for five reasons. (1) The World Trade Center bombers threatened to attack "nuclear targets" with "150 suicide soldiers" in a letter to the New York Times. 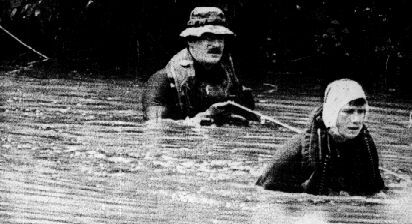 The letter was received four days after the bombing and authenticated by federal authorities. (2) The anniversary of the Three Mile Island nuclear accident would occur only several days after the letter was authenticated. (3) The world-famous plant just had security weaknesses exposed to the world by the intruder. (CNN broadcast news of the intrusion.) (4) Law officers observed the terrorists conducting a night-time mock assault on an electrical power substation near the training camp. (5) At the time of the FBI raid at the training camp, the FBI believed there was still a third cell of terrorists at large. Since the bombers were actively preparing to carry out additional attacks, the FBI's failure to alert the NRC and TMI is alarming. Eighteen hours after the raid, I telephoned the NRC Emergency Response Center to suggest that TMI be required to activate their "12-hour contingency plan" for truck bomb protection. The call was handled very thoroughly with the official asking me to repeat the information two more times as he accurately echoed a summarization. Ninety minutes later, the Emergency Response Center called back to say that the information was confirmed by the FBI and wire reports. The official said that my request was being treated with seriousness and that he had talked with other NRC staff who knew me and were familiar with my testimonies to the US Senate and the NRC regarding security issues. He assured me that I could rest knowing that the matter was now under careful deliberation. But, the NRC refused to err on the side of caution and Three Mile Island did not activate their plan! In 1989 the NRC instructed licensees to develop a plan which could be activated within 12 hours of notification by the NRC. There is one other inexcusable problem regarding TMI's contingency plan -- it doesn't exist. Eight months after the FBI raid on the camp, the Nuclear Control Institute and I presented testimony to the Advisory Committee on Reactor Safeguards for their debate on whether or not vehicle barriers should be required. The NRC had not informed the committee of the proximity of the camp either. 6/28/93 -- Our request to activate the "12-hour contingency plan for truck bombs"